We selected some of our 2018 favorites for this gift guide. A nordic ski pant equally well suited to running, hiking, and snowshoeing the Wool Pant is a warmth masterpiece. Bjorn Daehlie, until the last Olympics was the winningest athlete in Winter Olympics history and one of the top two or three VO2max every measured and nordic skiing was his game. Since his retirement this Norwegian legend he has built his brand into one of top few Nordic apparel brands, outfitting many national and Olympic teams. Daehlie knows winter and high output activities in all seasons and the gear required. The Wool Pant is beautifully and ruggedly crafted and has a full windproof front with a very thin laminated wool lining.The rear top is also the same windproof water resistant fabric which is treated with a fluorine free Bionic Finish Eco DWR. jersey for warmth and enhanced movement. There is a single deep zip pocket. The leg zippers extend to the knees and are rugged with the lower cuff back by a durable sticky band all of this to better survive the wear and tear of boots. The gray lining is the thin laminate of wool “fuzzy” to cut chill and absorb moisture. Ideal Uses: Nordic skiing, running, snowshoeing, hiking, and spring Alpine skiing. I tested them in temperatures from about 50 F (10C) ( a bit warm at the shins) to 14 F (-9 C) in great comfort with nothing but run shorts underneath. For very cold conditions wear with a thin base layer such as Daehlie Airnet Wool. Also available in a women's style. This stretchy, very soft baselayer is 100% merino wool. It features more open elastic net areas in all high heat areas such as the upper back, behind the arms and lower legs and a more solid fabric elsewhere such as lower back and shoulders for a touch of warmth. We have run this layer in both cold, wet, and wind and alone or under a shell and it does an admirable job thermoregulating and keeping chill away. Available in men’s and women’s styles. These two jackets have been my got to for just about everything this fall and early winter. I have used them solo or in combination for running and everyday use due to their subtle classic style in my jackets’ colors. The Fast Wing Hybrid is a very light hooded windproof water resistant shell with soft stretch cuffs and a wide stretch waistband. The fit is roomy enough for winter layers without being overly tight. The waistband insures the jacket will never ride up. You can unzip the jacket most of the way down and roll it into the waistband on the go into a neat package. I did this during a recent windy half and found the slippery ripstop was very easy to pull off my shoulders and put back on. I also liked that the sleeves can be easily rolled up and stay there. A snap strap at the upper chest allows the jacket to be partially unzipped while staying in place. T further help ventilate high heat areas there are laser cut vent holes cut behind the wrist as well as in the arm pits. The zipper is very easy to operate on the go. The hood has a light built in headband to keep it in place. There is a single zip chest pocket into which the jacket can be zipped and plenty of reflective hits which compliment the dark color instead of overwhelming it. The Warm is a softshell type jacket. This means it is not fully windproof but is very decently so as well as water repellant due to the density of its weave. It’s an obvious companion to the Fast Wing Hybrid. On Thanksgiving I ran in 15 F (-9 C) very windy conditions with the Warm and Hybrid over a thin base layer and was plenty warm but never overheated. The warm part comes from the fairly thick lightly brushed on the inside front. The back and under the armpits is lighter jersey material with a thinner mesh panel down the center upper back. There are two side pockets, one with a key clip. The fit is relatively generous. The zipper pull is particularly fine, easy to pull with gloves and with a nice lockdown. The extensive subtle reflective hits provide night visibility and for sure enhance the look. Equally fine for running, nordic skiing, and hiking the Warm does around town duty in fine style as well and its durable construction should last you for many years of adventures. Also available in women’s style. Also available in women’s style. This year I have been racing in OS1st Compression Sleeves. 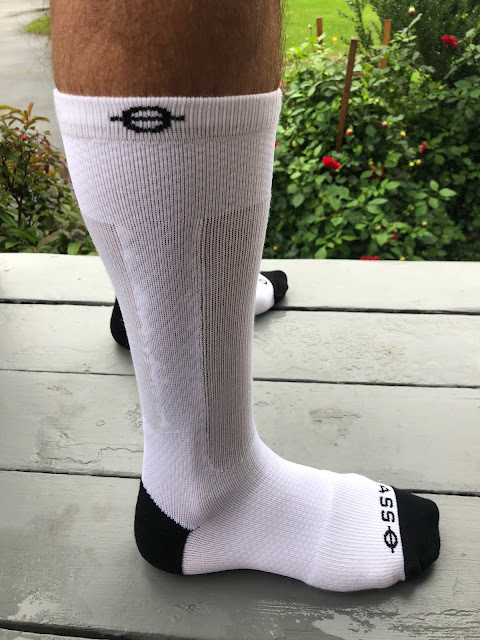 Very light weight they provide the stout support I need to reduce tibial vibrations and keep me aligned in racing but are not overly snug and constrictive and never noticed in heat or cold. The Swift is said by Running Warehouse to be Galen Rupp's warm up pant. I like the way Galen thinks! The area above the knee is a very light soft stretch fabric with plenty of room and if wet less stick. Laser cut holes behind the knees ventilate. Below the knees is a snugger jersey fabric, no bagging for a sleek look. 2 deep reflectively trimmed front and deep zip pockets and a small rear sweat proof rear pocket provide plenty of carry for a phone, gels, gloves and a hat. Other reflective hits will keep you highly visible, There are no ankle zippers here. Also available in women's style. Ideal Uses: Temperatures between 30 and 55 F ( -1 to 13 C) including in breezy or damp weather. I would wear them for winter racing in temperatures between 35 F and 25 F.
This Balega sock mixes mohair and Drynamix moisture resistant fibers in a soft thicker blend. The ON High Run socks have a deep heel pocket with some padding. The arch has good support and they stay up and in place. The high portion is lightly compressive and sharp looking. The fit is impeccable as is the comfort. Designed to help reduce ankle rolling, the very soft, lightly compressive Lasso socks are a high tech remake of the gym socks of old. Extremely comfortable, with a gentle calf and side of calf hold and support they are a new and pain free take on compression. Go to any major marathon expo and the racket you hear will be the Theragun in action relaxing tense marathoners. Many walk away purchasing one. The Theragun uses percussive action at the rate of 40 percussions per second to activate muscles and relieve pain. It can help release knots, break up scar tissue, and aid recovery. Our family fights over ours. It comes with three different heads for every area of your sore body! The Rekovr is a new take on the wool felt “hut shoe”. Built on a Topo trail shoe platform it has a wool and microfiber blend upper. The foot hold is pretty darn good with the wide straps so a bit of light running would be possible in them in a pinch. Designed to be worn barefoot, they have a massaging 3mm drop Ortholite footbed with deep fairly ridges which feel great after a workout. The Rekovr has a stout trail outsole. You might imagine they could be too warm in summer. Not so! We tested them in summer and were perfectly comfortable. In fact, the foam based recovery clogs felt clammy and here nothing of the sort. And of course, now that we are in winter, they are most cozy.! After several months of fairly frequent barefoot use they remain admirably stink free. They make an ideal recovery shoe in all seasons, can easily make it to the mailbox in winter, and are a great travel and driving shoe for the post race trek home. You must be teasing a future review with those Mach 2s on your feet. Please follow us there, on FB, and YT as we do some early impressions on the way to reviews.